The Nationals are now dead, much as they have died many times before this season, but this time it’ll really take, coming as it did at the humiliating hands of the Marlins. So it’s time for postmortems! Here’s a good Washington Post story containing the anecdote that’ll come to define this lost year, and, in keeping with the stupid nature of this stupid season for the stupidest division’s stupidest team. The stupidest stupidity of all? 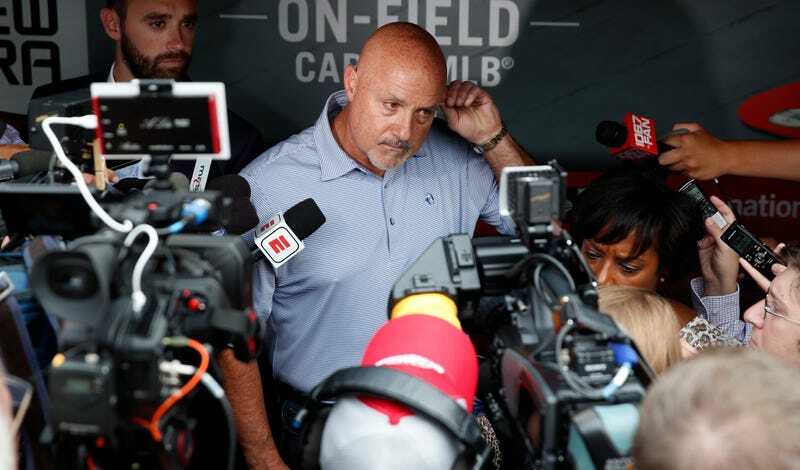 The moment that irrevocably rumpled the Nationals’ morale and their hope of making one last surge came in a game they won by 21 runs, and resulted in GM Mike Rizzo nearly coming to blows with reliever Shawn Kelley before DFAing him. On the day of the trade deadline, the Nationals mostly stood pat rather than be buyers (for J.T. Realmuto) or sellers (of Bryce Harper). They’re 4-9 in the last two weeks, squandering a real and excellent chance to make up ground, and it’s hard to blame anything but the bullpen. In August, they have lost four different games they led in the seventh inning or later, and another that was tied in the ninth. This was probably the single most crushing loss of the season for any team. Rizzo denies he traded Kintzler because of any of that, and instead claims it was a move to shed payroll—though he says if he had known the bullpen would suffer the injuries it has this month, he wouldn’t have made the deal. Consider Rizzo and the Nationals the first GM and team to ever declare We have enough relief pitching, I suppose, and they were properly burned for it. The second move was the booting of Shawn Kelley immediately after his appearance in a 25-4 win over the Mets on July 31, hours after the trade deadline. You may remember that game as the laugher that made it appear the decision to not break up the band was a thing that might galvanize the team and lead to a sustained run. Depending on who you talk to, Kelley was either upset over being called on to pitch the lowest-leverage ninth inning ever, or upset over allowing a home run, or upset that his manager hadn’t come out to support him when he got peeved with umpires for asking him to slow down his delivery. Either way, Kelley slammed his glove into the dirt and glared into his own dugout. Rizzo headed down to the clubhouse and confronted Kelley, according to people familiar with the situation. The argument became heated, including raised voices, and eventually it almost became physical, according to people familiar with the exchange. Adam Eaton got between the two of them and separated them before things could advance further, but Rizzo’s frustration was not isolated. Scherzer and Madson also faced up Kelley that night to express their disapproval of the outburst. Not long after, Rizzo told Kelley he would be designating him for assignment, then issued his “if you’re not in, you’re in the way” proclamation to reporters the next day. Adam Eaton has apparently learned a lot about leadership from Drake LaRoche. After that blow-up, Kelley was designated for assignment and subsequently traded to the A’s. He has not allowed a run for them. The A’s, since the trade deadline, have closed from five games back to one. The Nationals, over that same span, have gone from 5.5 games back to 6.5 back. Just When You Think We&apos;ve Reached Peak Mets, Noah Syndergaard Comes Down With "Hand, Foot, And Mouth Disease"